I was given the opportunity to try some new Master Lock luggage locks on my recent trip to Oklahoma. I have used the Master Lock brand in the past and they are definitely quality luggage locks. The company sent me a set to review, all opinions are 100% my own. For years I have been using these luggage locks (love the colors) and the company just sent me these flexible cable style ones. I have a black and silver and I really like them. They took some getting used to after using the other plastic ones with non cable closures that I have been using. The Master Lock luggage locks are all TSA approved. This means that if the Transportation Security Administration (TSA) needs to screen your bags at the airport, they can do so without cutting your locks like they used to. They just use a little universal key that opens all approved TSA luggage locks. Each luggage lock has a 3 dial, set your own combination. Really simple to set AND reset if you need to. I am tempted to try the keyed luggage locks because they seem a lot more convenient than having to dial in your 3 digit code. Plus I LOVE the colors, teal, pink, silver and PURPLE. I’m probably better off with the dial combinations though because I would worry about losing the key. Here’s a quick video on how to operate these luggage locks. Told you it was easy! 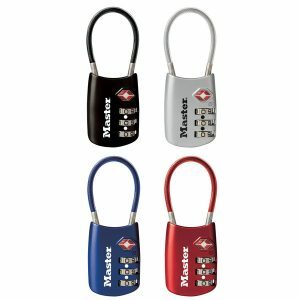 Have you ever used Master Lock luggage locks?